Constipation has become a very common problem in school-going children, owing to the unhealthy diet and lifestyle practices children follow these days. Kids tend to opt for foods like burgers, pizzas, ice-creams and various deep fried foods which are rich in harmful fats. It may not only cause various heart problems in children, but may also lead to various gut problems like constipation, that is, a difficulty in emptying the bowel and passing stools fewer than three times a week. 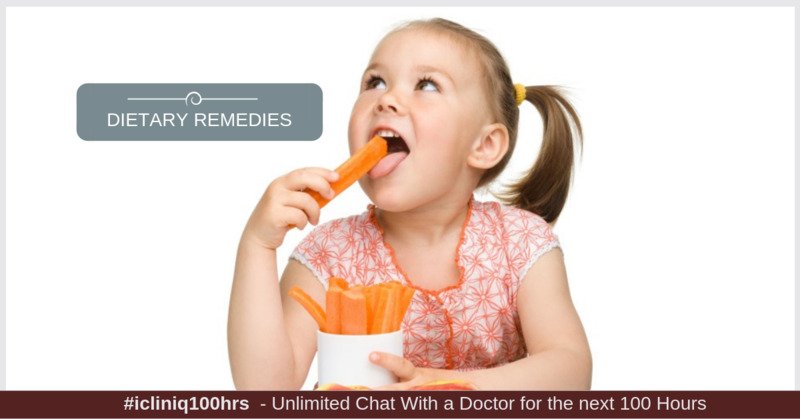 Following are few of the dietary remedies to treat constipation in children. I get the feeling of emptying my bowel whenever I go out.Please help. Lack of fiber in your child's diet is one of the most common reasons for constipation in kids. Ask your child to consume a lot of fruits and vegetables which are rich in fiber. Fiber is non-digestible, but it helps the stools to pass smoothly. Fruits can be given to children in the whole form rather than as juice. Various fruits like sapodilla (chikoo), grapes, and papaya help eradicate constipation in children. Lack of fluids can lead to issues like constipation in children. Make sure your child consumes at least eight to 10 glasses of water per day which will also protect your child from dehydration and prevent constipation. Fluids can be incorporated in various forms in your child’s routine like water, fruit juice, tender coconut water or vegetable juices. Vegetable juices are a good source of moisture and fiber and would also provide nutrients needed for growth and development. Good sources of probiotics like curd and buttermilk help destroy harmful bacteria in your child’s gut and thus enhance the growth of good bacteria. Never miss out on giving your child probiotics. Not only probiotics, try giving your child prebiotics which enhances the activity of probiotics. Cut fruits can actually be dipped in yogurt dip and given to children along with some sprinkled flax seeds or chia seeds which are very good sources of omega three fatty acids (good fats) and anti-inflammatory in nature and thus protects your kid from various infections and diseases. Make sure your child performs some kind of activity every day. Sitting in front of the television will only make your kid lazy. Make sure s/he hits the ground and plays games like relay, potato race, kho-kho and sack race which will boost the metabolism of your child and also make him/her active. These are some of the natural and effective methods to prevent and permanently treat constipation in children. Do you have a question on Constipation or Baby Constipation? Is my 8 months old baby suffering from Hirschsprung's disease or severe constipation?